Property Size 666 sq. ft.
Durango Colorado vacation rental condo at Silverpick Condominiums near Purgatory Resort. Whether visiting Durango for skiing, summer Rocky Mountain adventures, attending a wedding, riding the Durango Train or visiting Mesa Verde National Park with friends, family, significant others, or a travel group, this Silverpick Condominium is a great choice to stay in a spacious, comfortable, cozy and romantic vacation rental home. This one bedroom, one bath condo is decorated for comfort and style with a two minute drive to Purgatory Resort and about a 28 minute drive to downtown Durango. The ground level ( no stairs ) condominium offers guest a living room with wood burning fireplace, queen size sleeper sofa, large TV, deck with woods and mountain views, a full kitchen, full bath and private bedroom with a king size bed. This home is surrounded by tall aspen trees and glacially-carved cliffs, making a most spectacular site for fantastic views during the golden fall color of autumn. 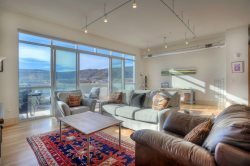 Mountain views can be seen from many windows, the large deck and even the parking area located a few feet from the condo entrance. Located very nearby, is the community hot tub, park for picnics with playground and the outdoor wedding venue. This condo has remained a very popular wedding venue condo as a romantic nest for bride and groom, as well as a cozy retreat for VIP wedding guests attending the many weddings held at the Silverpick Lodge and outdoor park just feet away and a short walk to both. The Sow’s Ear Restaurant, also located in the Lodge, is a one-minute walk from this condo and an ideal stop for fine and semi-fine dining, plus a comfortable bar area. Families with kids, large groups and wedding events are welcome. Contact the Sow’s Ear to make reservations, see the menu and check for seasonal hours. Motorcycle enthusiasts will find all-paved parking and unloading areas that are only a few hundred feet off the paved San Juan Scenic Byway, which offers a popular scenic drive for motorists of all kinds. Serious road cyclists with find the paved highway north to Silverton or south to Durango to be scenic and challenging routes. Mountain bikers have many choices of trails that allow bikes, and hikers are minutes from a vast array of high mountain hikes fishing lakes and iconic mountain scenery. Horseback rides and more await summer visitors, and this condominium is a very convenient location to winter activities including skiing and snow boarding at Purgatory, snowmobile tours in the high country, cross country skiing, horse drawn sleigh rides and more. Please contact us with any questions regarding your stay at this lovely and charming mountain getaway. Condo was as expected from AB&B listing. Location was very good. Lots of hiking trails and fishing streams near by. Enjoyed our stay in Durango area. We loved our condo and would definitely come back! A deposit of 25% to hold your reservation and the balance is due 30 days prior to arrival. instead of a security deposit we highly recommend Rental Damage Insurance to cover any accidental damage that may occur during your stay. Check in is 4pm and check out is 10am. Please inquire for earlier check in or later check out we will do our best to accommodate your request.